In addition to owning more shoes than I can possibly wear, I am also the proud owner of way too many unused bags and accessories. I never knew what to do with them, though, when it came time to clean out my accessory drawers. Then, the ladies from Sweet Notions contacted me and I think my little castoffs will finally have found a new home. 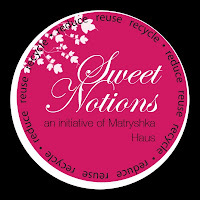 Sweet Notions is an initiative of Matryoshka Haus, a U.S. 501c3 charity which exists to spin out new projects, initiatives, and social enterprises that bring transformation like this one. Sweet Notions accepts donations of accessories like jewelry, handbags, scarves, hats, belts, ties and cuff links (even if they need a bit of repairing). Some items go to a Sweet Notions Mobile Boutique Event or Pop-up shop and the money generated goes toward funding Sweet Notion's Design Camps. Donated items that are to be repaired or repurposed get used at the Design Camps where women learn skills like sewing, beadwork, embroidery. The women also gain merchandising and retail expertise that will teach them how to run a boutique event and sell the items they made. That's not all: Sweet Notions is fabulously eco-friendly! They aim for 0% waste and try to use every single item in their boutique collection or design workshops. If you have sad accessories that you no longer need or wear, give them a new life! If an item you want to donate has sentimental value, you can let them know so that they can value and market the piece accordingly. And if you simply refuse to part with that purple butterfly Coach scarf, you can make a cash donation instead and continue making the world a fabulous place.